HOW ARE POSTURE AND LOW BACK PAIN RELATED? Did you know your posture plays an important role in how much stress is absorbed by your spine? Perhaps you have had low back pain while slouching in your office chair or on your sofa while watching TV? You may have possibly felt low back pain after a day of cleaning the house or garage. If you have experienced low back pain in any of the scenarios above, please read below to learn more about the correlation of stress on the spine and low back pain. Our back has natural curves that make up our spine. The neck and low back are composed of an inward curve, while the mid back is composed of an external curve. These natural curves help maintain posture and reduce tension throughout the low back. Unfortunately when we slouch either while sitting or standing increased tension and pressure is placed on our low back. Depending on what task is being performed, incorrect posture will determine the amount of stress being placed on the spine. When sitting down, ensure that there is a little inward curve in your lower back and your shoulders are aligned with your hips. To help maintain the natural curve you can roll up a little towel and place it behind your back to help preserve the correct posture (view picture). If you are standing still or standing with a weighted item in your hand, posture is crucial. It is important to maintain your shoulders aligned with your hips and to not bend at the waist when standing with a weighted item. It is also important to remember to maintain the knees aligned with the ankles. In other words your knees should not extend over your toe. When standing with no weight the shoulders should still align with the hips as well as the knees with the ankles. 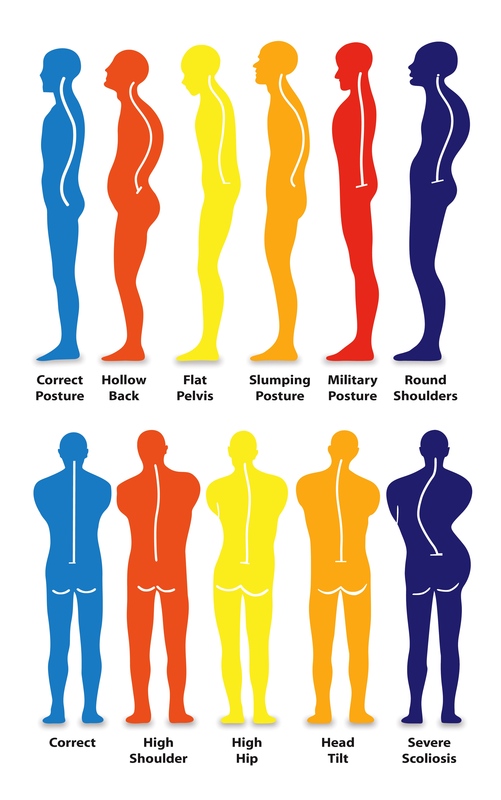 If you are experiencing low back pain or are worried about your posture, be sure to visit Emery Physical Therapy. The therapist at Emery Physical Therapy will assist you in proper posture positioning as well as assist in low back pain to keep you and your low back healthy. Call Emery Physical Therapy today at (847) 786-2014 and make your appointment today.